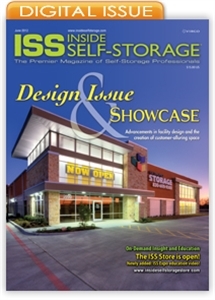 This issue of Inside Self-Storage highlights trends in facility design, adding curb appeal, and building successful ancillary areas, such as wine storage, records storage, boat/RV storage and retail. Self-storage has come a long way from it’s days as single-story buildings relegated to industrial areas. Today’s facilities feature more colors, materials and architectural designs than ever. With curb appeal and customer comfort in mind, facilities are built and renovated with new materials and designs to easily blend into retail and residential areas and meet stricter municipal standards. The June issue highlights new trends in facility architecture and design, adding curb appeal, and building successful ancillary areas.